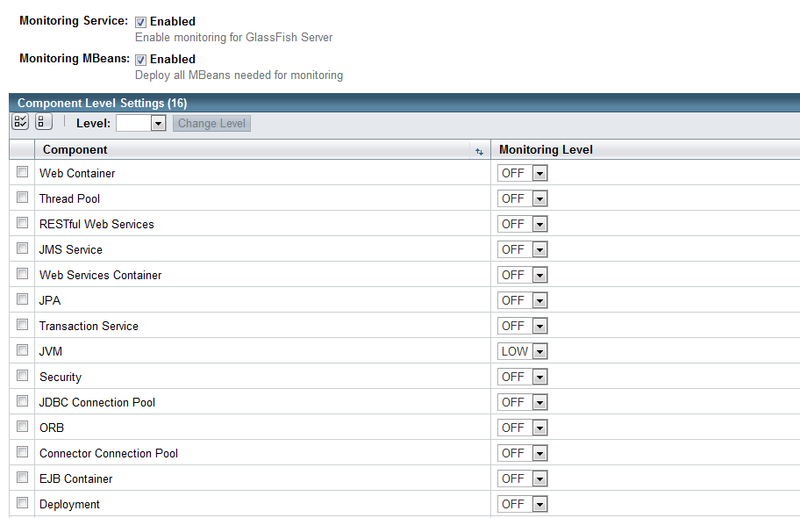 In this blog post I will explain how you can enable and monitor the memory statistics of the Java Virtual Machine in GlassFish 3.1.2. There are 2 ways to enable JVM monitoring: by using the graphical admin console, or from the command line by running the asadmin command. Start up the admin console (by default this runs on port 4848), log in as admin and click on “Monitoring Data” in the left menu. Now click on “Configure Monitoring” in the right menu for the instance you want to monitor. You should now see the screen with the list of configurable components (see screenshot below). Set the Monitoring Level of the JVM component to “Low” and click on Save. No instance restart is needed for this change. Start up the asadmin command (under the ../glassfish/bin folder). Use the subcommand “enable-monitoring” or “disable-monitoring” to enable/disable monitoring for a specific component. To specify the instance that you want to configure, add the “–target” option. Click on “Monitoring Data” in the left menu and then on “Server” (under “View Monitoring Data”) in the right menu. You should now see the Server Monitoring screen (see screenshot below). 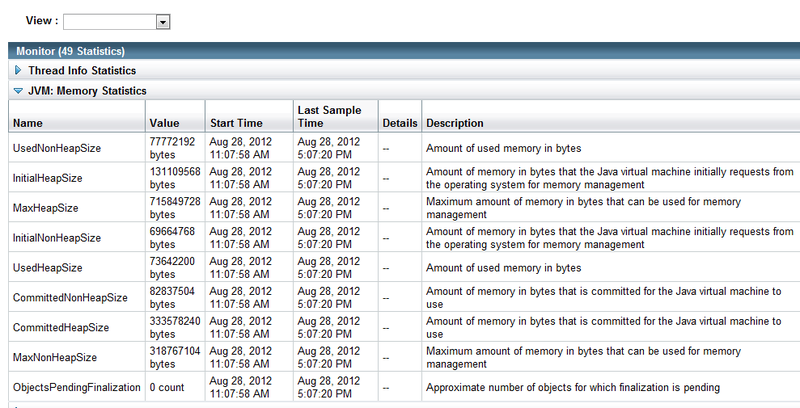 To view the JVM memory statistics, click on the blue arrow next to “JVM: Memory Statistics”. Start up the asadmin command. Use the “get –monitor” subcommand to retrieve the required monitoring statistics. To schedule the monitoring of memory statistics, you could easily add a command line entry to your crontab file. The following example will execute every 10 minutes and write the datetime and the usedheapsize to a log file.